In the first of a series of interviews on the maturing Tezos ecosystem, Bitsonline talked with Edward Tate, who’s written an Avalanche-based implementation in OCaml that could one day be folded into Tezos. Avalanche is a new consensus mechanism that offers “simplicity, high performance, and […] amenability to parameterization,” Tate told us. William Peaster, Bitsonline: In being one of the newer consensus innovations to hit the scene, many are still unaware of Avalanche, or at least what it is precisely. How would you characterize Avalanche, what sets it apart? It’s compatible with directed acyclic graphs, or DAGs, correct? Edward Tate: Avalanche is a consensus mechanism based on the concept of metastability, which is the probabilistic guarantee that an outcome will be converged upon by a set of participants in a network. In the context of a cryptocurrency, the outcome might be a transaction being included in the ledger. The DAG is there in order to keep the transactions stable over time and keeps track of the level of acceptance of a transaction — this is a bit like the amount of confirmations in Bitcoin. What sets Avalanche apart from other solutions is its simplicity, high performance, and its amenability to parameterization in order to adapt to different levels of trust. For example, in an untrusted setting it can achieve over 1000 transactions per second with 4 second finality with 600 byte transactions and maintain a high level of security in a network of 1000 nodes. In a trusted network it is possible to upgrade the TPS significantly by tweaking the security parameters. William: You’ve authored Igloo, an in-progress implementation of Avalanche in OCaml for experimenting with changes to Tezos. 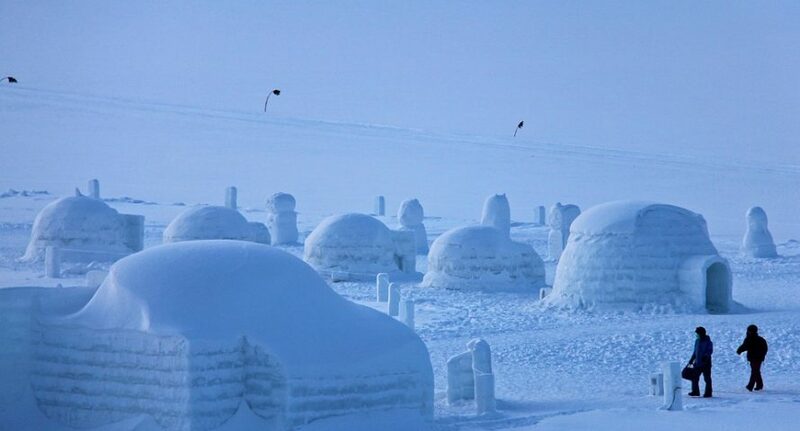 It might be for experimentation now, but could you envision a day where Igloo or another Avalanche-based implementation underpins Tezos? Would you support such a shift, and if so, why? Edward: Igloo is implemented as a MirageOS unikernel, which forms a lightweight operating system and can be deployed across a variety of virtualization backends. It is designed this way in order to scale experiments and could eventually become an independent platform in the future. It would be great if successful innovations become Tezos protocol upgrade proposals and are voted in by the Tezos network, but whether the proposals get accepted or not will be based on how it compares to what the core team is currently developing as well as other Tezos development groups. If there is a substantial improvement on our end, then it is likely that the network will upgrade when a proposal is initiated, which is exciting. William: You wrote Igloo in OCaml. Bitsonline has previously highlighted conjecture that the use of OCaml in Tezos might make the project ideal for complex DApps in sensitive fields. What’s your take on Tezos’s use of OCaml? Edward: OCaml is a great language because it encourages functional style whilst remaining pragmatic, and it integrates with modern formal verification tools. Tezos allows for the development and integration of secure, formally verifiable and (eventually) zero knowledge contracts, which derive from the secure multiparty computation setting and will thus be better suited to more serious applications that require rigorous mathematical guarantees and provability. The use of OCaml also allowed us to leverage MirageOS in particular. William: What originally attracted you to writing Igloo for Tezos, as I presume you could’ve written the implementation with another project, or projects, in mind? Edward: Tezos has amendable governance that works today with an intelligent implementation, whereas other projects either do not understand the benefits, like Ethereum, or implement it badly, like EOS. It would be extremely difficult to change the way consensus works in either of these projects. Tezos also has a relatively fair distribution of tokens across stakeholders compared to other projects. William: What’s next for you personally, and are there any points of interest in the Tezos community that you think our readers should be keeping an eye on? Edward: At the moment I am working on zero knowledge proofs and how various implementations might integrate with Tezos in the future. I think everyone should be keeping an eye on those right now due to the potential benefits with respect to blockchain scalability and privacy. Avalanche itself first hit the limelight this year back in May, when its pseudonymous development group Team Rocket — peripherally aided by professor, computer scientist, and crypto-pundit Emin Gün Sirer — published their “Snowflake to Avalanche” whitepaper. 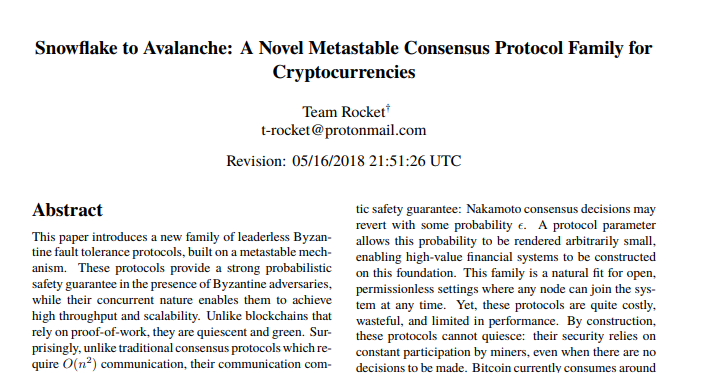 At the time, the whitepaper took the space by surprise, its authors outlining a novel “family of leaderless Byzantine fault tolerance protocols, built on a metastable mechanism,” as Team Rocket put it. The biggest thing in crypto since Satoshi's whitepaper. It was a bold assertion that many traditionalists in the cryptoverse wasted no time in contesting, but even still, and as Edward Tate’s Igloo shows, excitement and development around Avalanche is growing. “The purpose of Igloo is to experiment with cryptocurrency network related technology and protocol upgrades for the Tezos network,” Tate explained of his own widening, Avalanche-underpinned project on its GitLab repo page. For Tate and for others, the fledgling mechanism has paved new avenues for exploration and experimentation — a dynamic that should, in turn, bring other explorers in their wake. What’s your take on Avalanche as a consensus mechanism? Be sure to reach out and let us know what you think on Twitter or in the comments section below. « Stellar's Jed McCaleb Is Dumping Ripple: Is He Breaking Any Laws?